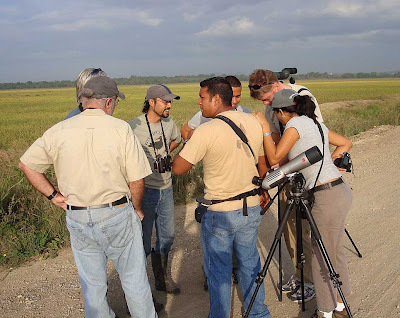 As promised, early this morning found a group of intrepid birders (including Rosabel and Karl Kaufmann, George Angehr, Carlos Bethancourt, Jeremiah Trimble, Steve Langer and Darién and Camilo Montañez) at Tocumen Marsh, hoping for the Spotted Rails and Paint-billed Crakes seen in the area since last Friday. And o what a morning it proved to be, with six species of Rallids seen and lifers galore for everyone involved. A juvenile Spotted Rail was spotted almost immediately upon reaching the spot, which is on the road out to the beach, about 100 meters before the end of the section of road with rice fields and ditches on both sides. More interesting was the gray wing and red leg dangling out of the bill of a Great Egret, which flew off a bit but then was convinced by George to give up its booty: the third Panama specimen of Paint-billed Crake. 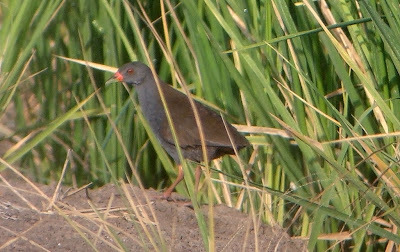 After a few White-throated Crakes (seen by Camilo), lots of Soras and a smaller number of Spotted Rails, Rosabel called the group from a spot further out on the road. A berm of bare earth between two sections of rice (on the right side of the road as you head for the beach) was crawling with rails: seven or eight Soras (out in the open, all the time), at least four Paint-billeds (which would come out for sun or walk from one side to the other but generally kept to the edges), and two Gray-breasted Crakes (one which scurried from one side to the other, followed ten minutes later by a second bird that flew across). These Paint-billed Crake photos were taken by Rosabel. Playback of the Gray-breasted tape produced response but, of course, no fly-ins. The sixth species of the day was a Yellow-breasted Crake seen at the edge of the rice on the left side of the road by Darién and Camilo. As a follow-up to Carlos message, I'd like to share the results of our visit to Tocumen this morning (9 March). The place was Crake City. Most of the rail activity was on the road that leads to the coast, between about 730 (when we arrived) and 930. Spotted Rail. Our party saw at least 10 individuals, and probably more. Quite a few appeared to be juveniles, with dark or dull bills. There were at least one, and probably two, very small downy black chicks seen as well. These are the first records of which I am aware since 1984. Several individuals were photographed. Paint-billed Crake. We saw at least 4 individuals (2 groups of 2) running repeatedly across a short dike perpendicular to the road. We also saw a Great Egret on the road which had captured one. As we were watching it, it dropped its prey, and I was able to recover it (quite dead). This I believe is the third Panama specimen, and first from Tocumen. These I believe are the first reports from Tocumen since 1982, and the first from anywhere in Panama since 1988. Several photographs. Sora. Incredibly abundant. At one point at least 10 or 11 were visible at the same time standing on the same dike as the Paint-billed Crake. Many were also seen as they flushed out of the rice as we walked along the road. Gray-breasted Crake. At least one seen briefly as it alit for a few seconds on the dike, showing its rufous nape. A total of three or more heard. Carlos has been reporting them from this general vicinity for the last year or so. Yellow-breasted Crake. One seen along a ditch by Darien and Camilo, and one of the other birders. White-throated Crake. calling in the rice fields. 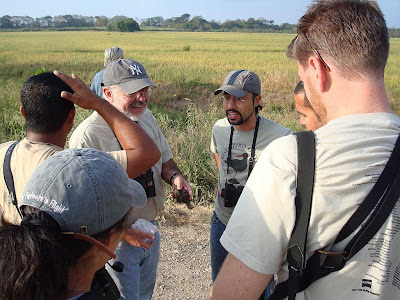 From Bob and Dodge, I would be interested to learn more about the details of the Colombian Crakes seen at Tocumen in the 1980s. There is an implication that they may not have been of the ssp ripleyi described from a specimen from Achiote Road. Considering how heavily Tocumen has been birded for the past 24 years, it is really extraordinary that these species should suddenly (apparently) turn up again in such numbers.